Trapezius muscle, also known as traps, gives support to neck and spine and because of their important role, they are considered to be one of the most important upper body muscle groups. If this body area is fully developed, it will give your body a muscular look which will compel the people to say “wow”. Let’s have a look at some of the important factors on how to build impressive traps. There are a number of useful exercises and one such workout known as ‘Barbell Shrug Behind The Back’ which works great for traps and it can be easily included in your regular training sessions. This exercise is considered to be amazingly effective to get the desired results quickly as it is fully stimulates traps and make them work perfectly. Well developed, powerful & strong traps will not just reduce the risk of injuries but also help in strengthening muscles in upper body area. With barbell shrug behind the back, trapezius muscles are targeted as the main muscles while the middle back and forearms are worked as secondary target. In order to perform this exercise, you need to arrange barbell which will be used as the main equipment for this exercise. 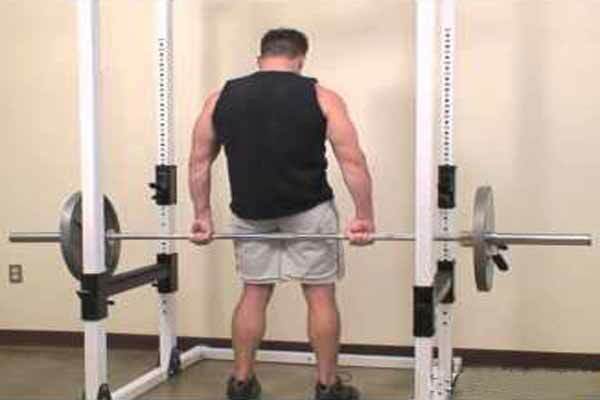 Stand on your feet and place your hands behind your back and hold a barbell with both hands. Now lift your shoulders as higher as you can and breathe out at the same time. Stay on this position for 1 or 2 seconds before you go back to the starting position. 1 rep is completed with this process.